In the search for the Dogfish that swallowed Geppetto Pinocchio finds himself alone on a beach being bullied by a group of boys. 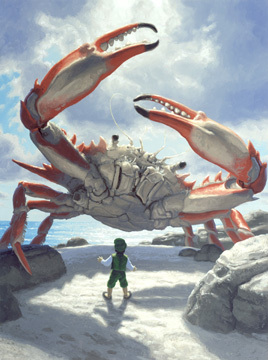 In the midst of their fight, there is a giant crab who rises out of the water and tries to shout to the boys to cease their fighting. Sadly, the boys refuse to listen and the crab eventually leaves. Greg did a fantastic job of capturing the massive size and appearance of power that this creature would have had, despite his small role in the overall story.